Are there waiting room chairs that are suitable for larger patients, patients with mobility problems or patients with physical impairments? Bariatric styles of waiting room chairs are ideal for patients that are larger, patients with mobility problems, or patients with physical impairments. This is because these chairs are very sturdy and solid in design allowing patients to use the arms to transfer easily to the chair from assisted mobility devices or when needing a bit more security with movement. Waiting room chairs designed for bariatric patients are also larger and roomier through the seat and back of the chair. This gives patients a sense of comfort and prevents difficulties in pushing up and out of the chairs since there is a space beside the patient for the hands. The arms are also there for added support and lift for patients that prefer this option. High back waiting room chairs are also often preferred by patients with physical or mobility problems. This is because they do provide more support and a greater ability to use the back of the chair to move forward on the seat for easier transfers. This is much easier than the lower back chairs where the patient would not have support across the shoulders to slide forward in the seat. For a very natural look to waiting room chairs, what materials are most recommended and how practical are they? Wood frames and bases on chairs give a very natural look to a waiting room, examination room or consultation room or office. These chairs can be ordered with a range of wood finishes from very light options such as oak through the dark mahoganies. Complimenting the wood finish with a coordinating upholstery color can also add to the warmth of the room. With lighter woods blues, greens, teals, creams and softer tones are a great option. Darker woods can accentuate the deeper colors of the royal blues, forest greens and henna colors. The wood is treated to be non-porous and resistant to scuffing, scratches and marks. It can be easily cleaned using standard disinfectant and cleaners typically used in medical settings. The mortise and tenon joints are very strong and are also treated to prevent liquid from entering the joint, making cleaning very simple and easy. What options are there for waiting room chairs that can also be used in medical or patient rooms? 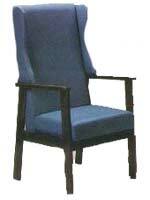 There are a variety of different styles of waiting room chairs that are designed to be multi-functional. Different styles of MRI compatible chairs are perfect for both waiting and reception areas as well as treatment and diagnosis rooms. Since ordering chairs in volume can reduce your overall cost per chair, these dual usage chairs can really add up to significant cost savings. It also helps in creating a very uniform and cohesive look to all the rooms within the facility. 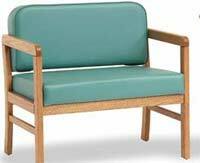 These same chairs can also be perfect for use as visitor chairs in patient rooms, very durable, solid yet also stylish in design.